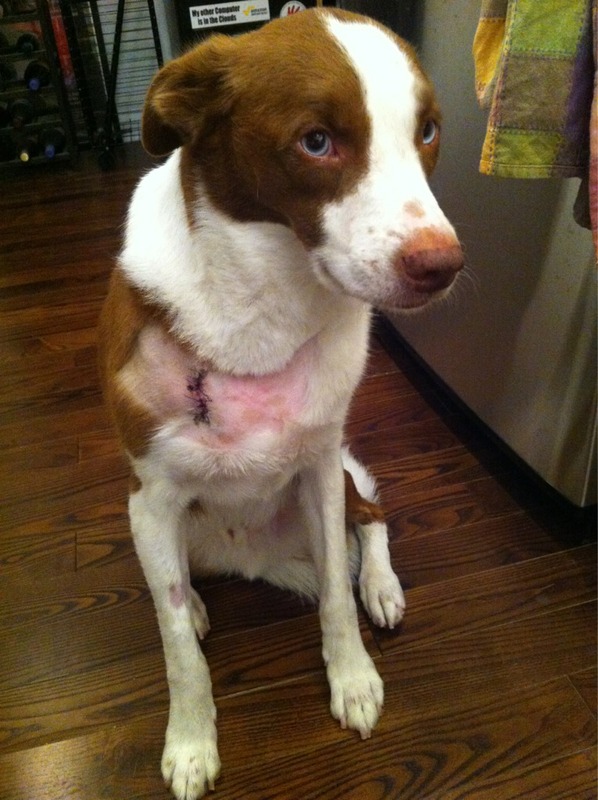 Sweet CB had his growth removed yesterday and is recovering nicely at home. Poor guy is also wearing his winter boots and socks so he can't scratch the stitches. I'm sure he will be good as new in no time. It's just hard seeing him like this. Awww... CB! I'm sure he will feel like a new pup with the growth gone, once his hair starts to grow back. Poor little guy! I cant wait until we can run again.... Then we can all meet up at the doggy park! Ahhhhhh. What a sad little furry face! Glad he did well! Feel better CB! I'm sure he'll be back to himself in no time! 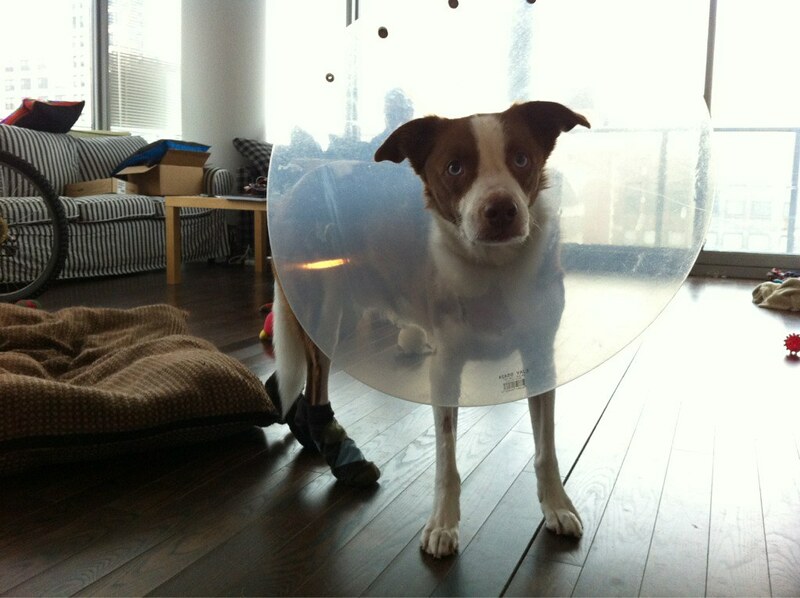 There is something oddly entertaining about a dog with a cone on his head even though they can look so pitiful. The last time one of ours had one, watching her try to get out of the dog door or drink out of the water bowl made for many great laughs! Good luck, little buddy! I'm sure it looks worse than it is. Thanks! I keep telling myself that... Definitely not used to seeing him like this. Praying for a speedy recovery for your furry man! 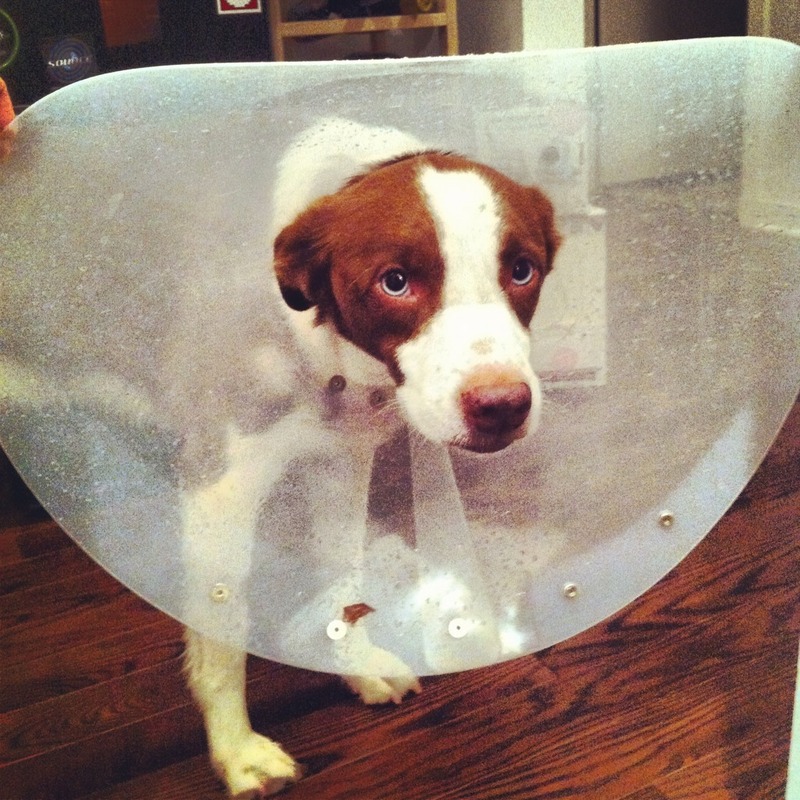 Oh no the cone of shame...poor guy. Wow that was quite the incision. I am glad he is doing okay. I am sure since he is so healthy from all your runs he will bounce back quick. He has a ton of energy, and i have to make sure he doesnt try to bounce around and play with me. Im sure he will be back to normal soon. Glad he made it through surgery good. He does look funny in that cone of shame! 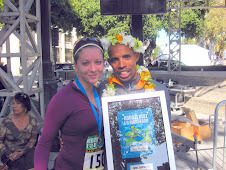 I pray his recovery is speedy and he is out running with you again soon! Cola dog has been up and about quite a bit until he started feeling sassy and tried to play with the horses and got himself kicked in the sore leg :( but he does love your treats. I wish we had some cool dog treat places here so i could send some to CB as he heals up, give him a big hug from Cola and I. That is a big spot on his chest, hope he starts to recover soon. For the NYC marathon, I always thought it as a big money grubbing organization, though it does seem like an awesome race to do. Seems like most of the big races are - though Chicago seems a little easier to get into and also run. For the finish line generators, I read a story that said that the race couldn't just immediately give the generators to the victims. Just seeemed like there was a lot of mis-information out there, and the runners felt the wrath of it. He will recover fast. When you are a positive thinker, you can make your dreams, hopes, and wishes come true. That's true. Trust me, he will be good as new. I wish CB the speediest of recoveries!!! I understand how heartbreaking it is to see him in post-surgery mode. But he will be as good as new in no time!!! BIG HUGS!!!!!!! How the eff do you run a trail race? This week is gonna rock! The night I got to workout on Soldier Field.